Before you click “Place Order” on your next trade, there’s one thing you should look for. Ignore this tip and you’ll forever be forced to accept returns far below what you could be taking home. But if you use this simple “last minute” check before you make a trade, you’ll see an immediate improvement in your results. My name is Bill Poulos and I’ve been trading the markets since 1974. My early results were hit or miss. But once I discovered this “last minute” check I’m about to show you, things turned around for me. Did you catch the key phrase in that? What Is A Deliberately Trading Market? Have a look at this chart. See how smooth it looks? I’m not talking about whether you think the price action will continue to move up, or if you think it will reverse direction. But notice how the general “movement” of the chart is smooth. Notice how this chart is choppy. Erratic. There are wild swings up and large moves down. You have gaps in prices. You have a helter-skelter kind of price action. From one day to the next, you don’t know if this market is going to go up or go down. You don’t know what’s going to happen. It looks like an electro-cardiogram where it just bounces back and forth, all around. This kind of price action spells risk. It is definitely not a market that is in motion and staying in motion. It’s a market that’s encountering opposite forces all the time, day in and day out. You want to stay out of this kind of market. There’s no need to trade this kind of market when you can trade a deliberately trading market. So what most people do when they try to make money in the markets is they just pick or follow someone else’s recommendation without regard to understanding deliberately trading markets. And even if they have a proven trading plan, the odds are stacked against them if they attempt to trade non-deliberately trading markets. But if they only trade in markets that are deliberately trading, the odds are overwhelmingly in their favor. 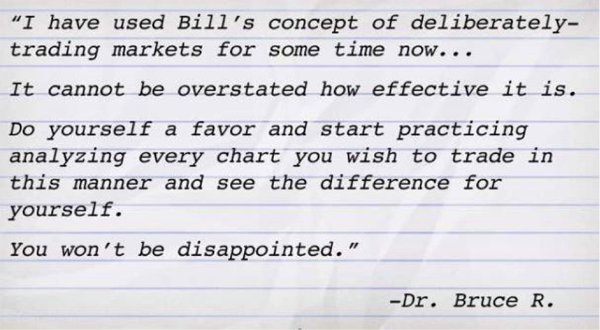 So before you click the “Submit Order” on your next trade, review the chart and give yourself the benefit of a final check to see if you price action is deliberate or non-deliberate. This simple technique could be the breakthrough you need to take your portfolio to the next level.